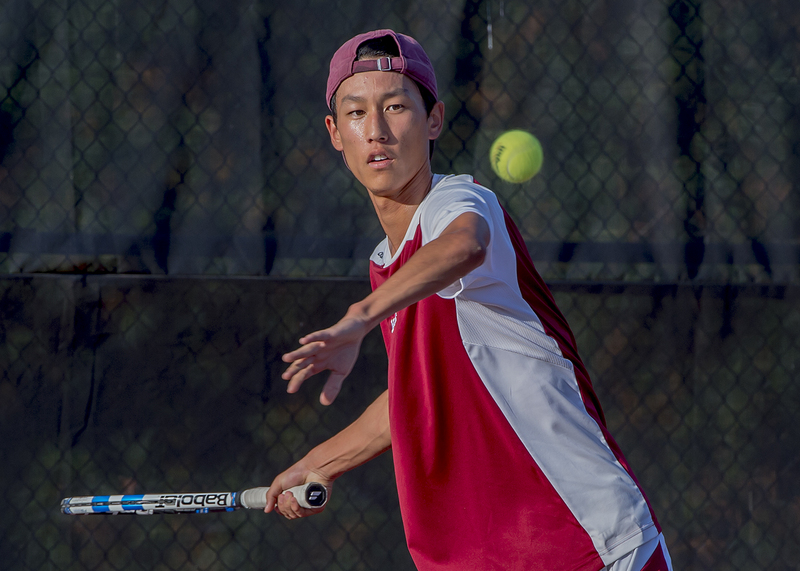 In their first matchup following a spring break training trip to California, the Vassar College men’s tennis team hoped to defeat Ithaca at Josselyn Tennis Courts. Though the home team secured a 4-3 lead with two remaining matches, their opponents eventually fought back to earn a 5-4 victory. Entering the day, the Brewers boasted an .800 win percentage in Liberty League matchups, with strong singles and doubles records on the year. Five different players entered the day undefeated in Liberty League singles matches, while four doubles pairs held the same advantage. This momentum gave the Brewers a crucial base of confidence heading into the tough matchup. “I thought our confidence level going into the match was good. We had a pretty tough stretch of losses going into this match, so we were extra hungry for a victory, especially since Ithaca is a conference opponent,” sophomore Jeremy Auh noted, referencing the team’s tight losses to Chapman University and Trinity College in California. Vassar had to fight to regain the lead after falling behind 1-0 in the opening doubles match, in which junior duo Robin Drummond and Jamie Anderson were defeated 8-2 as Vassar’s number-two doubles pair. In their fourth Liberty League doubles victory this season, top duo Auh and first-year Adam Krueger fought to earn an 8-2 victory and even the score. In a tight deciding battle, the number-three doubles team, junior Nick Zuczek and first-year Nicolas Demaria, cinched a monumental 8-6 win, giving Vassar the upper hand in doubles action. However, Ithaca’s players would not be left behind, earning a victory over Demaria in two sets, 6-3 and 7-5, in order to even out the scoreboard. The Brewers once again began to fall behind, as the number-six singles player, sophomore Zamir Birnbach, was defeated in two 6-1 and 6-2 sets. At this point, Auh stepped back in for his match as Vassar’s number-three singles spot. Despite an initial 6-2 deficit in the first set, he rallied to win the next two consecutive sets, 7-5 and 6-1, to secure the win and even the matchup at 3-3. “I think my forehand and my volleys help me a lot in both singles and doubles,” said Auh. “They were able to get me out of some tight, tough situations, and had I not been able to rely on those two shots, I may not have been able to pull out the win.” With this victory, Auh remains undefeated in singles, boasting a 5-0 record in the Liberty League conference thus far. Following this critical win, Anderson returned to the court, this time to take on Ithaca’s number-four singles player. Taking the win in two 6-2 and 7-6 sets, he improved his record to 6-3 on the current season, and improved the Brewers’ score of the day to 4-3. This tight lead could not be maintained, as the top two seeds for Ithaca ultimately defeated the Brewers’ top two players. First-year David Gandham, the number-one singles player for Vassar, earned an early 6-4 victory in his first set, but fell 6-3 and 6-1 in the following rounds, while fellow newcomer Krueger faced a similar fate. Though Krueger won his second set 6-4, his 6-4 and 6-3 losses in the first and third set, respectively, caused his ultimate loss. Despite this wrenching loss against Ithaca, the Brewers still retain a 3-2 record in the Liberty League and a .600 winning percentage. Individual players, as well as duos, continue to rank impressively high up in the league in their respective events. Sophomore Allen Sokolov remains third in the league in number-one singles, with a winning percentage of .667. Meanwhile, Gandham sits at second for the number-two singles with a .833, and Anderson ranks third in number-four singles with a .625. The impressive duo of Auh and Krueger sits third in the league for number-one doubles, only minutely behind the first place of .600. These upcoming league matchups are scheduled against the Rensselaer Polytechnic Institute, Saint Lawrence University and Hobart College, which currently rank third, eighth and second in the league respectively. The Brewers will next compete against the 26th-ranked Massachusetts Institute of Technology this Friday, March 6 in Cambridge at 1:00 PM. This matchup will be closely followed by another ranked non-conference team, number-15 Tufts University in Medford the next morning at 10 AM.